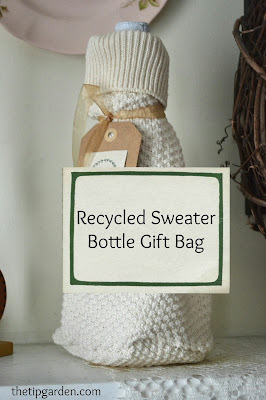 This Bottle Gift Bag is no cost at all if you use an old sweater your about to give away. 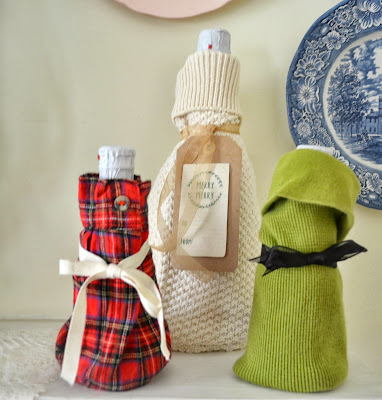 Using the sleeves is a perfect way to make a super cute gift bag for a bottled drink. Although my husband and I don't drink alcohol at all, occasionally we will grab a bottle of sparkling cider at our favorite apple orchard's market and give as a quick holiday gift. This cute gift bag is a way to dress up a rather ordinary gift and make it a little more special without spending any or much money. 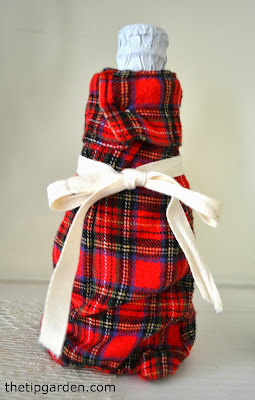 Besides bottles of drinks, it could be used for a gift of infused oils or vinegars, homemade syrups and more. 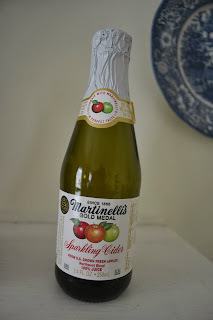 In the picture above I used both a full sized Cider bottle and those mini cider bottles found at the Dollar Store. That would be so cute at a holiday dinner table for everyone (including kids) to have their own little bottle of cider dressed up in a cute bag! You can use an adults or a childs sweater or shirt. as long as it is long enough and wide enough for the bottle, and any kind will generally work. 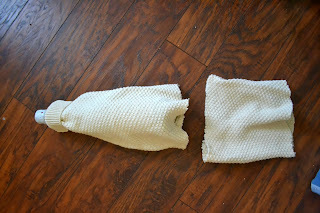 The one above is the kind that has a cuff that can be rolled down, but any type of sweater sleeve will work just fine. Ok, truth in crafting moment: I totally just winged it with out a pattern or directions, as I usually do, but have refined the directions for you below. The bottom of my bag ended up a little more triangle than circle, cause I just started stitching the bottom piece from a square shaped scrap and didn't trace and cut as the directions below. 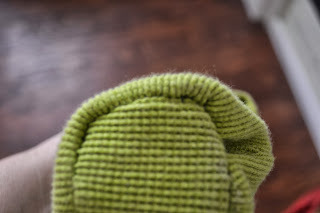 I just sort of trimmed as I stitched, and it turned out fine, but wouldn't recommend it. My second and third bags turned out "normal" once I used the directions I am including below. 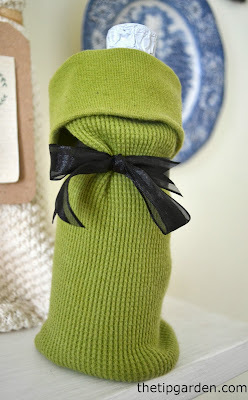 My second bottle bag shown above turned out way better when I used the directions below! Cut sleeves from the sweater. Carefully slide bottle into the sleeve, and adjust the top of the bottle to the top of the cuff of the sleeve. 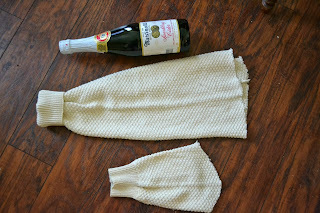 Open up the bottom of the sleeve so it is rounded (I would just stick my hand down the cuff ) and place it on top of the scrap of sweater. 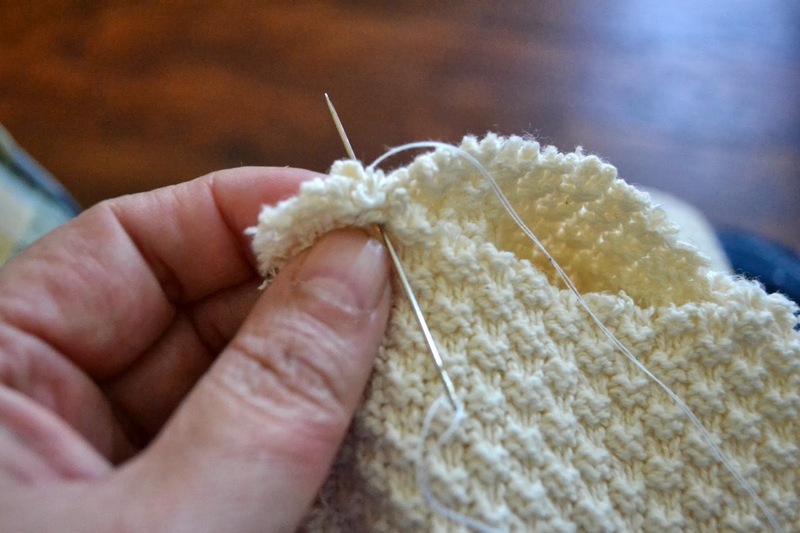 Trace a circle around the sweater about 1/2 inch wider than the bottom of the cuff. Cut out the circle. Sew the circle scrap to the bottom edge of the sleeve (not the cuff end) in a whip stitch, all the way around the cuff. Tie the end of the thread into a knot and cut. 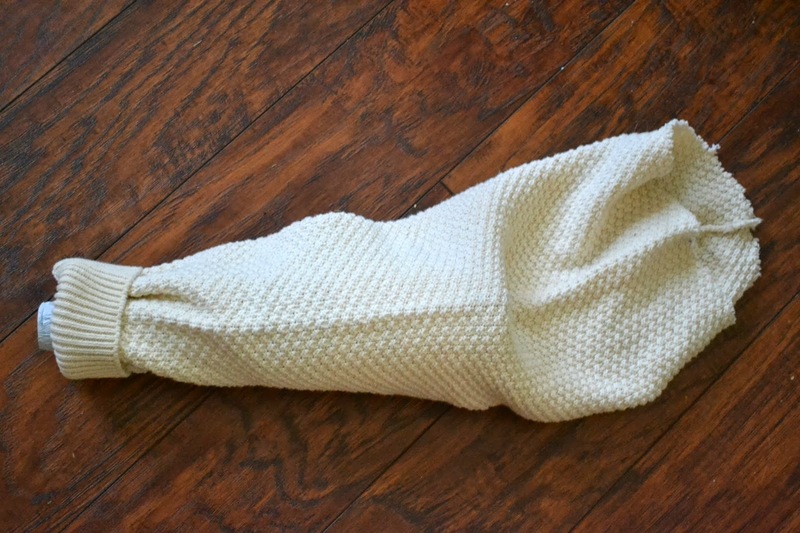 Turn your sweater bag right side out. Place your bottle in the bag. Embelish with ribbons and tags as desired. This is really an awesome idea. I love it. thanks for sharing with us at our Thursday Favorite Things Blog Hop. I'm also your newest GFC follower. Glad to have you Angel! Thursday Favorite Things Blog Hop have the best followers! So happy you found me! 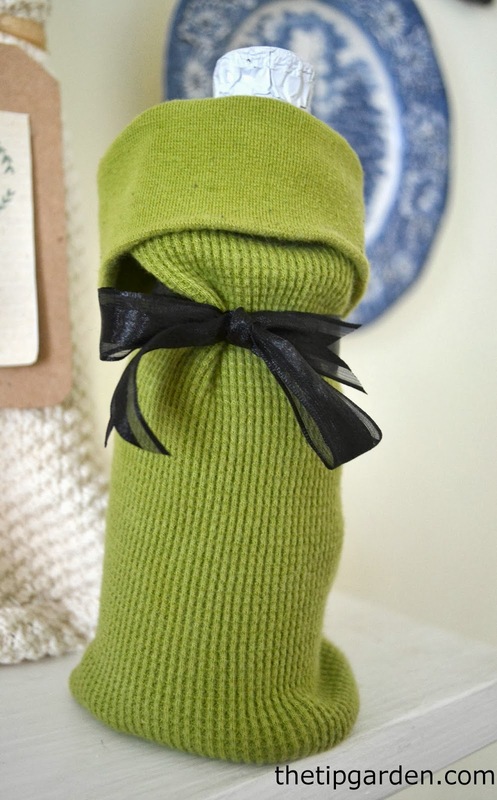 These cute little sleeves would also be cute by putting in a home canning item or even a bottle of Rhubarb Vanilla Syrup or other. Something homemade is Always a good thing to give as a gift and put in give baskets. I think I need to make a strip to the Goodwill Store and see what I can find for old sweaters or long sleeve flannel shirts even. Oh my goodness, that would be so cute! 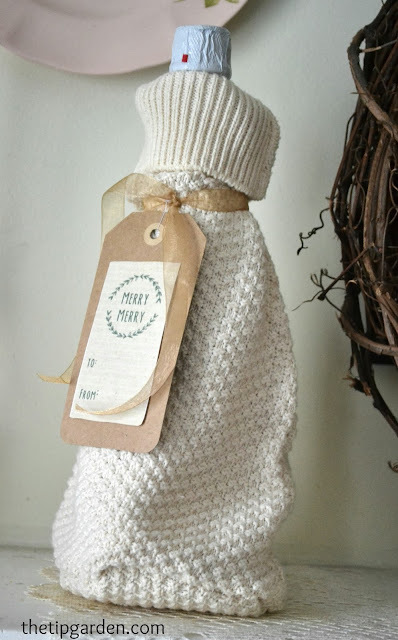 If you give away a small half pint jar I think a child size shirt would be worth a try! 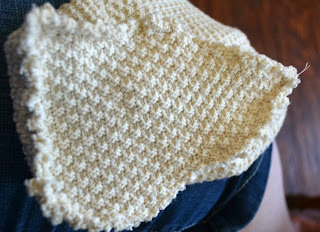 (just make it a stretchy cuff, otherwise I think adult size cuff on the sleeve) Love the idea!